The eastern tip of St. Thomas known as Red Hook isn't a full grown town as yet - but it's a self-sufficient area in terms of services. It contains a shopping center with a drug store, medical clinic, 2 banks with ATM machines and postal & secretarial service. Across the street is a busy marina, taxi stand, laundry, marine supply store and a bunch of great restaurants! Within walking distance is the public ferry to the island of St. John. And... within a 5 to 10 minute ride from Red Hook there are several hotels and many more restaurants! It's a good idea to make reservations for dinner. There's no need for men to wear a coat and tie, but do put on a shirt and shoes. Woman can wear skirts, long pants or nice shorts. Please, no bathing suits in public areas. Most restaurants accept major credit cards and travelers checks are accepted most places. There is ample taxi service available during dinner hours and like everywhere else, be sure to discuss the rate before you get into a taxi. Airport to Red Hook by taxi takes 30 minutes in medium traffic. The residents of the islands are english speaking. It's a custom of the island to offer a greeting to locals before you attempt to discuss business or ask questions. Simply say "Good Day" or "Good Evening" and you'll be welcomed everwhere. Located in Red Hook, St. Thomas - and visible for its Danish-style red-roofs - American Yacht Harbor Marina has a 105-slip capacity and two operational fuel docks, metered water and electric and telephone at every slip. A dive shop, 5 restaurants, ice cream shop, video rental store, bank, bait and tackle shop and several luxury stores are located on the AYH property. AYH's high-flying American flag - the largest in the territory - has come to symbolize not only the East End's boating center, but shopping and social hub as well. Monitoring VHF Channel 16. Tel. (340) 775-6454. Fax 776-5970. 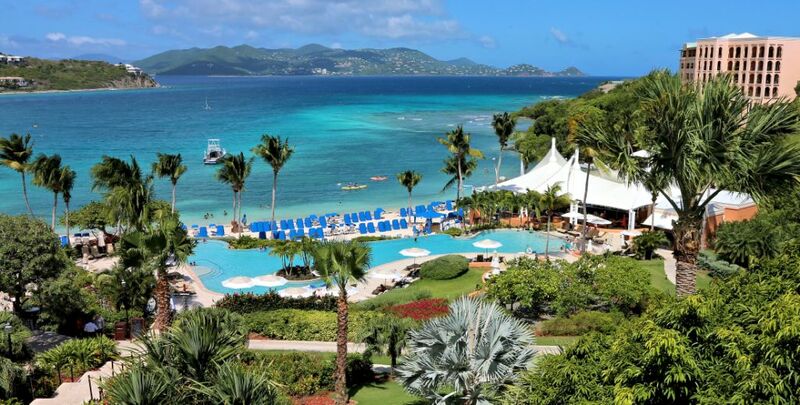 AYH's sister marina is the newer Yacht Haven Grand (YHG), dubbed the most luxurious marina in the Caribbean! 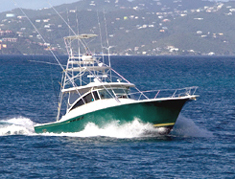 Neptune Fishing Supplies is the best-stocked tackle shop in the Caribbean! When it's needed, you can depend on owner Stewart Loveland and his crew to find it or to somehow get it! Neptune caters to both the local and stateside fishing fleet - maintaining their oil supply and battery needs and meanwhile keeping the shelves stocked with hooks, rods, reels, lures and colorful skirts. There is also plenty of fresh bait - minnows to mackeral - you’ll find what you need! In addition to their retail sales and rod and reel repairs, Neptune rents cars and books fishing charters, inshore and offshore. GET YOUR BVI FISHING LICENSE! Anglers, if you fish the North Drop - you'll probably spend most of your time in the waters of the British Virgin Islands. A BVI fishing license is required! Don't wait until you arrive the VI to apply because it takes time to get one! Your boat captain will advise you of the easy online proceedure or you can contact Lori Bailey at 340-775-9144 and she'll assist you for a small service fee. V.I. Game Fishing Club The V.I. 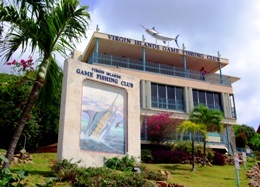 Game Fishing Club (VIGFC) is located in Red Hook (eastern end of St. Thomas). The clubhouse is just a stones throw from the American Yacht Harbor marina. The roots of the club date back to the mid-sixties when it's founders realized the potential of big game fishing in these waters. The VIGFC proudly owns it's own club facility and it's members are very active in their community. The VIGFC operates many year-round tournaments (Wahoo, Dolphin, Children, Couples, etc.) but the 'July Open' is the most looked forward to event by visiting fishermen. The 'July Open' is aways scheduled 3 days before the full moon. If you would like to join the Club or find out about it's many functions, tournament prizes and Calcutta - Tel. 340- 775-9144 or email See VIGFC website See Here . Marlin Prince - Capt. Eddie Morrison The Marlin Prince is one of the best known boats on the North Drop. Capt. Eddie Morrison has spent many years at the helm and he is always on the leader board when it comes to tournament competition. Marlin Prince is fully equipped for catching the big ones! Tournament. Black Pearl - Capt. Jim Estraca Black Pearl is an awarding winning 38' Bertram sportfisher captained by Capt. Jim Estraca. 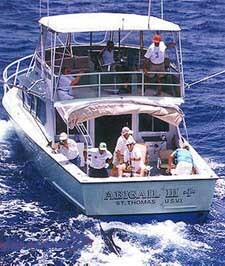 Black Pearl specializes in marlin fishing and affords it's clients an excellent opportunity to compete in tournaments. Black Pearl is is available for all tournaments. Bluefin II - Owned and operated by Capt. Don Mertens who custom built the vessel himself. Capt. Mertens has been fishing the waters of the Virgin Islands for three decades and if there is a marlin, wahoo or tuna out there - he'll find it! Bluefin II is located at American Yacht Harbor's "P" dock. Telephone (340) 775-6691. Abigail III - Capt. Red Bailey. Mention the name Abigail III and fishermen will tell you that Capt. Bailey is one of the best in the business! "Red" as he is better known has been fishing the waters of the Virgin Islands for over 40 years and knows the marlin on a first name basis! Note in the photo left that the blue marlin seem to follow him around! Abigail III is located at the Sapphire Beach Marina and just a 3 minute drive from Red Hook. Capt. Red has taken his clients straight to the top in many tournaments! Mixed Bag - Capt. 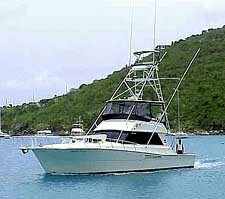 Robert Richards Experience some of the best sport fishing throughout the world in the Virgin Islands with Offshore Adventures. Captain Robert Richards has been fishing in the Virgin Islands for years. Rob and his wife Marni are the owners and operators of Offshore Adventures. "Mixed Bag" is a 2000 Luhrs 40' Open Express. The boat is equipped with the latest electronics and top of the line fishing equipment. 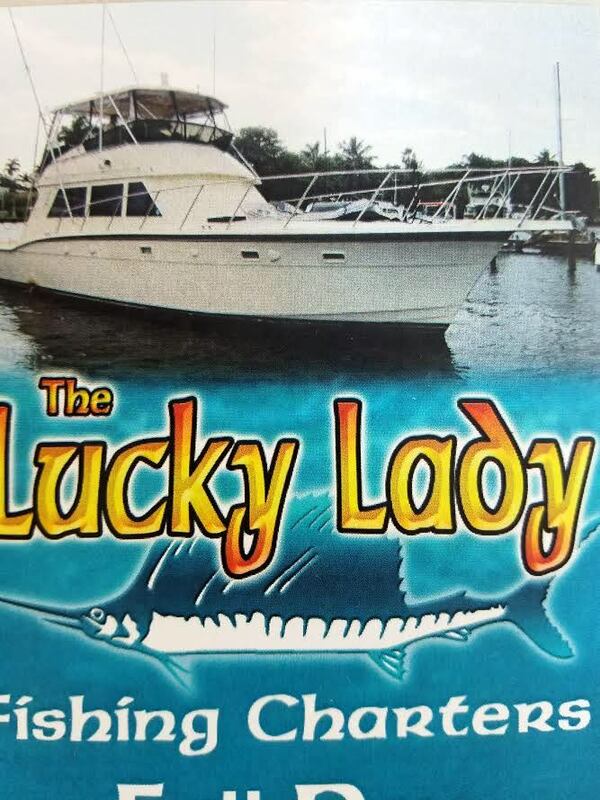 Hop aboard the 52' Hatteras 'Lucky Lady' for a fishing or snorkeling charter. Fish the drops for wahoo, tuna and all three species of billfish that migrate through these waters. 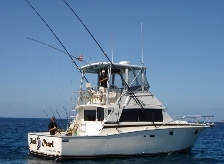 The boat is fully air-conditioned with 2 heads and has top of the line fishing equipment.